Hope you’ll join us for our Girls’ Night Out in Guilford on Thursday, December 6th from 5 – 9 pm. 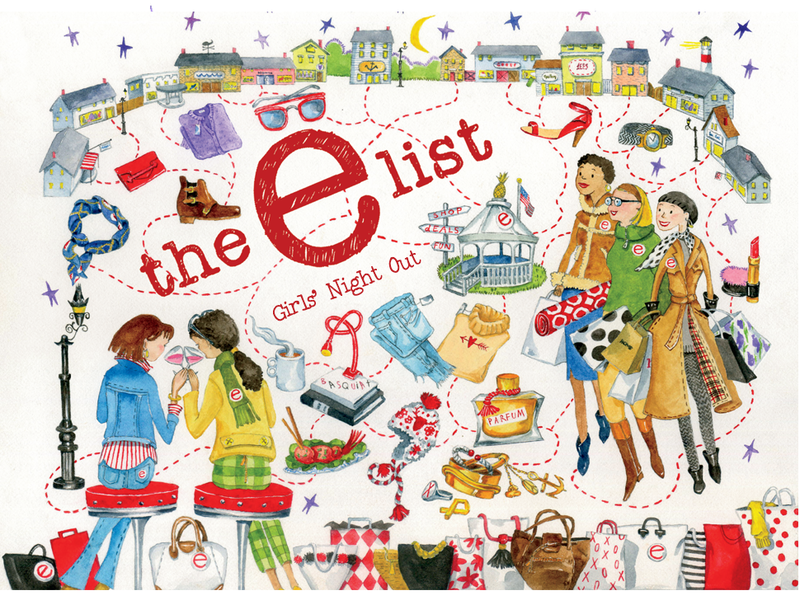 Meet The E List team between 5 pm and 6:30 at The Marketplace at Guilford Food Center for wine and beer specials and free hors-d’oeuvres, and to pick up your E List sticker to qualify for discounts. We are adding a second CHECK-IN location at Java Hut at 20 Church Street. Pick up stickers here as well and peruse the Quonset Hut shops. Then head out to the shops along The Green and take 20% off almost everything (some exclusions apply) at participating boutiques. Ballous 51 Whitfield St – Take 50% off select wines. Every $50 in gift cards get $10 gift card. Now serving Spirits and Cocktails. Call 203-453-0319 for your reservation. Happy Holidays. Breakwater Books 81 Whitfield St – Located on the Guilford Green, an independent bookstore that has been in Guilford for 46 years. Featuring books for all ages, cards, children’s games, and frequent author book talks. Come in and let one of their experienced booksellers help you discover your next great read! Chapter One Guilford 25 Whitfield St – After shopping, enjoy dinner at Chapter One. Half off house wines, 20% off other selections of wines. A food special choice soup or house salad, Pasta Primavera w/Chicken, and Churro Bites for $25. Reservations highly recommended. Click here to book your reservation. CHROMA Gallery 20 Church St – Come and experience 3 artist businesses all under one roof. BSK Design’s unique, colorful fused glass, holiday ornaments, and angel votives. Creek Chic Design- gorgeous belt buckles, nature-oriented beaded jewelry, and simply elegant and chic clothing. Paperscape Artworks is handcrafted paper art pieces that capture nature’s beauty in subtle and bold colors. Details 61 Whitfield St – The shop will be all dressed up and ready for the holidays, filled with wonderful and unique items for your home, yourself or that someone special. 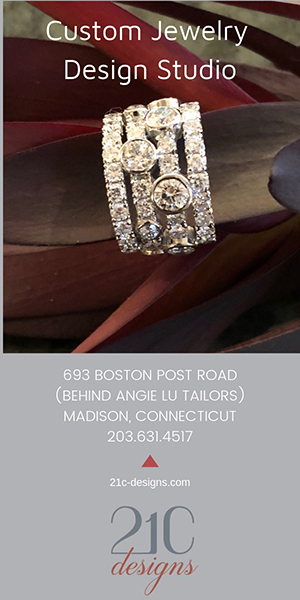 Stop in and be dazzled! Ella, Where She Shops 90 Broad St – Ella, Where She Shops is filled with wardrobe essentials for leisure travel, work, special event, or the perfect gift. You’ll find a vast stock of cozy sweaters, flattering pants, and jeans plus freshly strung pearls! Stop in to smell the new candles and feel the down scarves. Flutterby 55 Whitfield St – Celebrating their 20th year on the beautiful Guilford Green, Flutterby has won Best Gift Store, Best Women’s Clothing and Best Men’s Clothing Store on the E-List Readers Poll and The Shoreline Times! Come shop and enjoy your experience at Flutterby! Guilford Art Center, Artistry Holiday Shop 411 Church St – Located just 5 minutes from the Green – it’s worth the drive! Shop an eclectic mix of contemporary American crafts and jewelry handmade by over 200 American artisans. Find jewelry, accessories, ceramics, glass, home décor, holiday ornaments, children’s and men’s items and more. All proceeds benefit GAC’s educational and community programs. Java Hut: 20 Church St – Located in an iconic Quonset hut, Java Hut offers organic coffee, freshly made breakfast, lunch and more. Committed to using only the freshest, highest quality ingredients, incorporating as many local and organic products as possible. On-line ordering and Gift cards available! LuLu’s 75 Whitfield St – Lounge and outerwear, sleepwear and lingerie, body care and jewelry. Featuring jewelry by Ann Lightfoot, Margo Morrison, Simara 13 and local favorite Susan Roberts. Collections from Barefoot Dreams, UGG, PJ Salvage, Bella Dahl, Gretchen Scott and so much more! Lis a Lis a Salon 116 Whitfield St – Girls’ Night Offerings: Full Eyelash Extensions Sets starting at $99 valued at $175. 20% off all product. $100 value gift cards for $80 purchase price. Microblading and permanent makeup 20% off. Blow dry packages 20% off and services with the Dr. are 100 units of Dysport for $450. Marijane Boutique 57 Whitfield St – New current styles, accessories, jewelry & upscale designer fashions on consignment, so every fashionista is sure to score on something fabulous! Complimentary snacks & beverage. Mix Design Store 29 Whitfield St – Design Led Gifts & Home Accessories. The go-to gift store for all things modern. Carefully curated collection of high-quality design inspired objects, accessories & gifts for hostess, kids, pets. 20% off everything. ONYX 20 Church St – Wear a conversation piece! Unique ethically produced fashions, jewelry, and accessories from Australia and around the world. Now also featuring Comfy USA, Jason, and Sun Kim. Complimentary gift wrapping and Gift Certificates! Come in early to participate in a raffle to win $100 Gift Certificate! Page Hardware & Appliance Co. 9 Boston St – Find gifts for the toughest people on your list, decorations, and supplies to get your house ready for the holidays, all in one place. Free gift wrapping. Discount excludes grills, Miele vacuums, and major appliances. No additional coupons accepted with discount. Rock Paper Sistas 17 Whitfield St – A Coastal shop full of heART featuring artisan creations for her, him, heart, and home. Swish 57 Whitfield St – Johnny Was, Velvet, Michael Stars, Chan Luu, Sundry, Mother jeans and more contemporary collections. The Spice and Tea Exchange ® 80 Whitfield St – The Spice and Tea Exchange® offers more than 140 spices, 85-plus exclusive hand-mixed blends, 17 naturally-flavored sugars, 25 salts from around the world, and more than 35 exotic teas. The Spice and Tea Exchange® focuses on providing high-quality gourmet gifts and accessories to home cooks, chefs, and tea lovers in an old-world, spice traders’ atmosphere. Tracy Brent Collections 76 Broad St – Cocktail to casual clothing, jewelry, accessories. Including Trina Turk, Saint James; Tadashi; Ecru; Kinross Cashmere Joseph Ribkoff: Fairchild Baldwin, and more. Personalized service for the discriminating woman. Stop by our Broad Street location & Stop by and receive a free pashmina with purchase. Click here to see a preview of goodies in Guilford. Thanks so much to Guilford Savings Bank for their sponsorship of this event and continued support of Shoreline small business.